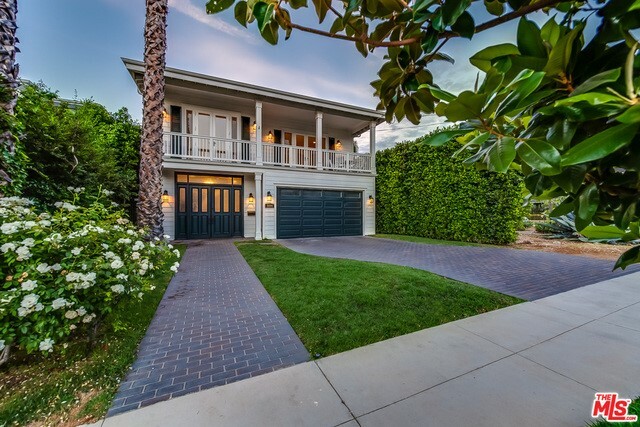 Set in the desirable Silver Triangle area of Studio City, this RARE Traditional home w/5 BD's & 4.5 BA's is flooded w/light, hardwd flrs throughout & soaring ceilings. Enter the home to the sweeping staircase that opens to formal LR w/adjacent home office that can also be a guest BD w/full BA & private entrance. The open flr plan has a great rm w/bi-folding drs that open the entire back of home, providing the ideal indr/outdr space. The backyard is a pvt oasis w/pool which feats dual swim jets. Inside, the chef's kitch feats top of the line appliances, bar w/seating & adjacent powder rm. Upstairs you will find 4 BD's & 3 BA's, one of which has a balcony w/views of the hills. Master BD boasts high ceilings, FP, walk-in closet & covered balcony. Master BA has shower, tub w/jets, dual sinks & storage. Home is 3,839 SF w/addt'l 856 SF finished basement which offers space for wine cellar, music studio, gym & more. Close to Carpenter School, farmers market & shops & restaurants on Ventura. I would like more information regarding the property at 3806 VANTAGE Avenue, Studio City CA 91604 - (MLS #2846046).